Gas leaks and burning stoves can be great threats in the kitchen. Don't let a few preventable disasters cause catastrophic injuries. 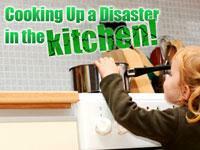 Learn how to keep safe in the kitchen. If you smell gas coming from the stove or the oven, immediately turn the appliance off. If you still smell gas, then you need to turn off the supply at the meter or cylinder, open the doors to ventilate the area, and extinguish all flames, which can cause explosions. Be sure not to operate any electrical appliances or switches. And never smoke in an area where you smell gas. This can cause an explosion. The last thing to do is to call a registered gas fitter. Do this away from the leak. Make sure each member of your family knows how to turn off the gas supply. Be aware if your gas is supplied by a pipe or a cylinder. If it is supplied by a pipe, the meter is outside the house. If it is supplied by cylinder, the flow can be turned off by screwing down the valve on top. Some other good ideas that experts recommend to avoid injury are not exactly the first things you would think of. For example, keeping your knife sharp can prevent cuts. If it is dull you will have to force it through what you're cutting, increasing the chance that it will slip and cut you. Don't put your dirty knives in the dishwasher. Wash them by hand to prevent the chance of someone reaching in and being cut by the blade. Kitchen safety is simple and well worth it. Should you encounter an emergency, remember that the first thing you should do is call 9-1-1.